Too many discipleship books are written for clean, perfect people who know all the right Sunday school answers. 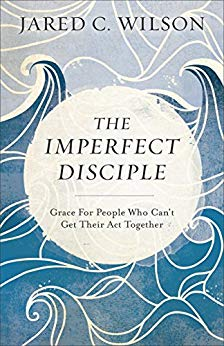 The Imperfect Disciple is for the rest of us--people who screw up, people who are weary, people who are wondering if it's safe to say what they're really thinking.For the believer who is tired of quasi-spiritual lifehacks being passed off as true, down-and-dirty discipleship, here is a discipleship book that isn't afraid to be honest about the mess we call real life. With incisive wit, warm humor, and moving stories, Jared Wilson shows readers how the gospel works in them and in their lives when- they can't get their act together- they think God is giving them the silent treatment- they think church would be better without all the people- they're not happy with the person in the mirror- and much moreWilson frees readers from the self-doubt and even the misplaced self-confidence they may feel as they walk with Jesus down the often difficult road of life. The result is a faith that weathers storms, lifts burdens, and goes forth to make more imperfect disciples.